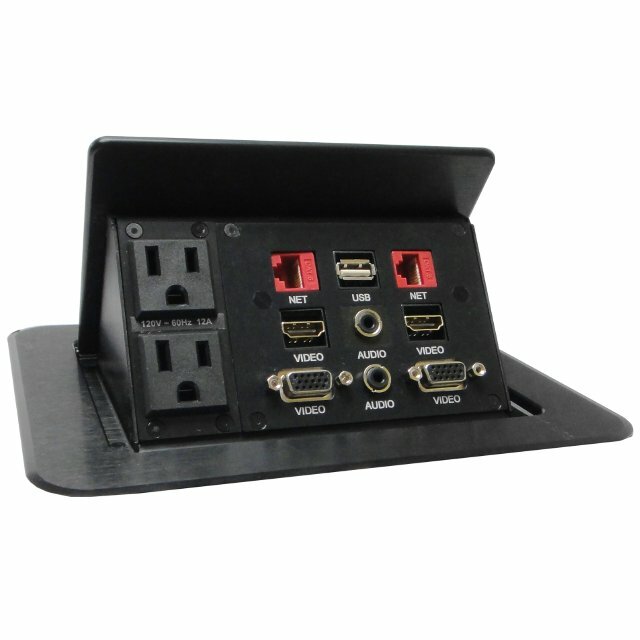 A pre-configured, compact hybrid interconnect solution with Digital (HDMI) and Analog (VGA) interconnects, along with network and USB connectors designed for mounting into tables, podiums, or other furniture as part of a presentation system. The TNP528 is a compact interconnect solution designed for mounting into tables, podiums, or other furniture as part of a presentation system. Inputs are accessed by pushing down on the top cover allowing the units to “tilt” open. The inputs are hidden by pressing down on the top cover until the latching mechanism engages. In the closed position, the top cover lays almost flush with the tabletop. All connectors are passive and have 6 ft. (2 m) cables that pass through to the bottom of the unit. The TNP355C is a compact interconnect solution designed for mounting into tables, podiums, or other furniture as part of a presentation system.